Another epic! Believe it or not some people like to read them or at least they tell me they do! Yep, mad I know but sending it to all so you have the option. For those that delete now I’m back this Sunday, back at work Monday – Gutted! It just keeps getting better! 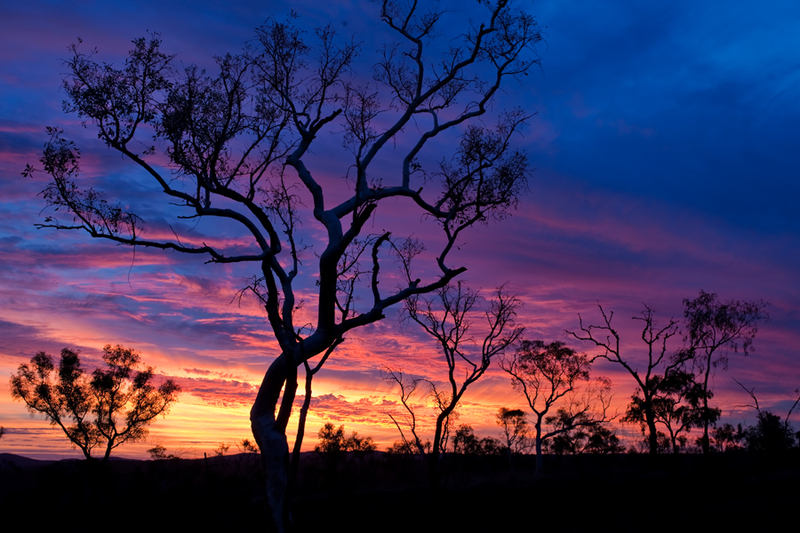 Western Australia (WA) – the biggest state covering 1/3 of Australia’s landmass yet only holding 1/10 of the population, 2/3 of which live in Perth and the surrounds. All facts and figures until you travel a big chunk of the 5000km coastline and realization dawns of how impossible it is to comprehend the size and emptiness of WA. It really is the remote wild west in parts and I have been witness to some of the most awesome spots of sheer beauty in the world which more than made up for the fact I was sitting on a small coach with a load of fellow backpackers! Despite the fact I’m like a duck to water when it comes to the world of backpacking, I was not looking forward to the whole ‘tour’ experience. My ideal mode of travel would have been on a motorbike or in a 4wd with a friend however I’m yet to make my fortune to allow such extravagancies! Determined to sit on the bus and be absorbed by my own little world and having minimal contact with fellow passengers I score a great seat at the front thus a great view. However, within the first minute my plan rapidly erodes as I become the tour guide and DJ all in one and everyone knows my name! How did that happen? Ummm…let me see…the cunning driver, preoccupied with finding his way as it was his first day on the job, bribed me with a 4ltr cask of cheap and nasty wine to read the commentary in his tour guide as we went along. I don’t even like cask wine but somehow I reasoned with myself that wine is wine (I was so wrong!). So much for my anonymity everyone kept asking me questions after that assuming I was a fountain of knowledge! I soon caved in and became my usual social self and made lots of new friends.The 10 days spent traveling up the coast was one of the best trips I’ve done and no way can mere words describe the grandness and the natural beauty of the diverse region therefore, you will be pleased to hear, I’m not even going to attempt to. Additionally, I am minded of the length of my last email so am trying to keep this one brief (Yeah, fat chance that will happen!). Instead I will list the highlights:The sunsets – every night on the West coast varying from soft pastel hues to bright red, vivid orange, purples etc. A great way to end the day! The stars – southern hemisphere skies are superb, especially when your in the outback where there’s not a lot of lighting. 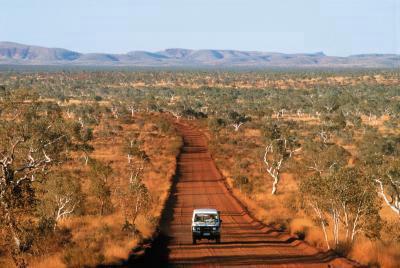 Driving through miles and miles and miles and miles and miles and miles of nothingness, long straight roads where only occasionally you may pass a car or truck, the further north you go the redder and more barren the land becomes. I just love the feeling of space and quite often it could be 2-300km between road houses, let alone small towns! So remote – Bliss! 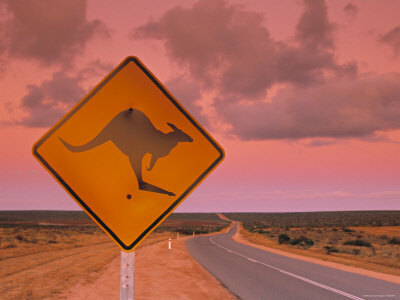 Kangaroos – everywhere! After about 4pm they are out in full force and seem to enjoy playing the game of chicken and quite often ending up as road kill! 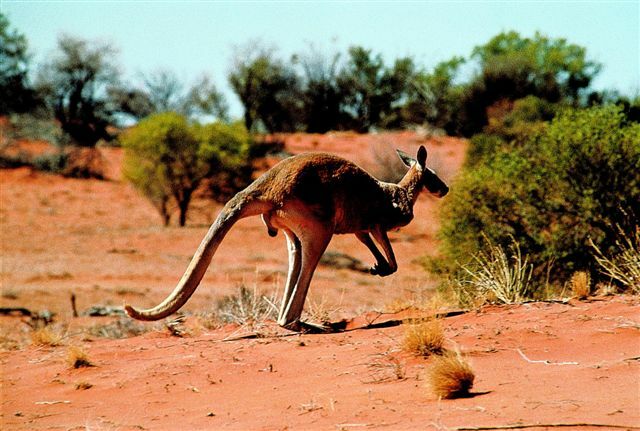 At one campsite a lady had a couple of Joey’s whose mothers had become road kill. I attempted to steal the cutie but didn’t get away with it! The Pinnicles Desert situated in the Nambung National park – a unique natural attraction of thousands of phallic shaped limestone mounds standing upright in the sand, some measuring a few meters for as far as the eye can see. Very bizarre! After the Pinicles we stopped for lunch on a beach in the middle of nowhere and I wonder off and find a jetty where I venture to the end of it, lay down and was so relaxed I fell asleep, on awaking I realise I’m supposed to have met back at the bus half an hour earlier and when I got there everyone is on the bus waiting for me! Ooops! 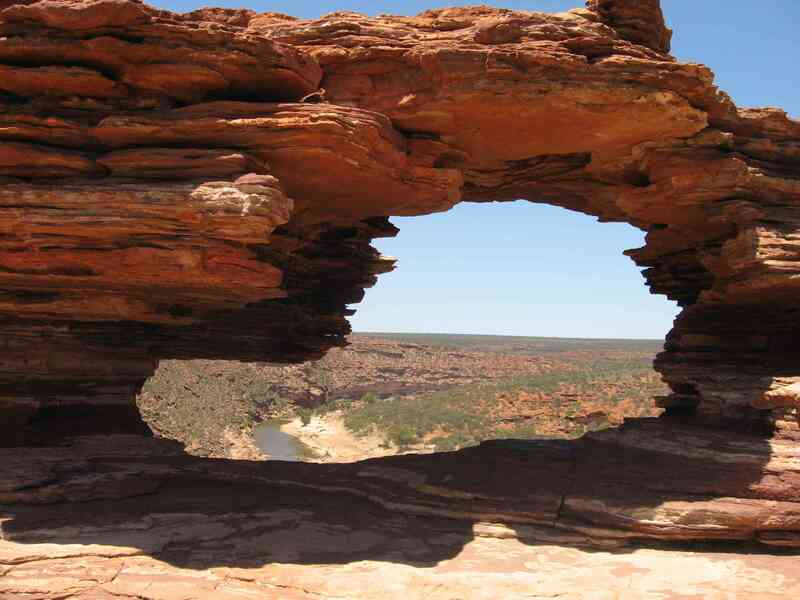 Kalbari Gorges – magnificent and the bright red limestone rocks reminded me a lot of Kings Canyon near Uluru. We climbed down and up one gorge, scrambling up and down massive rocks. I even did a bit of abseiling and was brave (or stupid) enough to do an abseil face first!!! Very scary when the rock is a flat face and all there is is down!!! But alas I live to tell the tale. Unfortunately, my photos did not! Shark bay world heritage region – I don’t need to explain why I wasn’t too keen on swimming here. 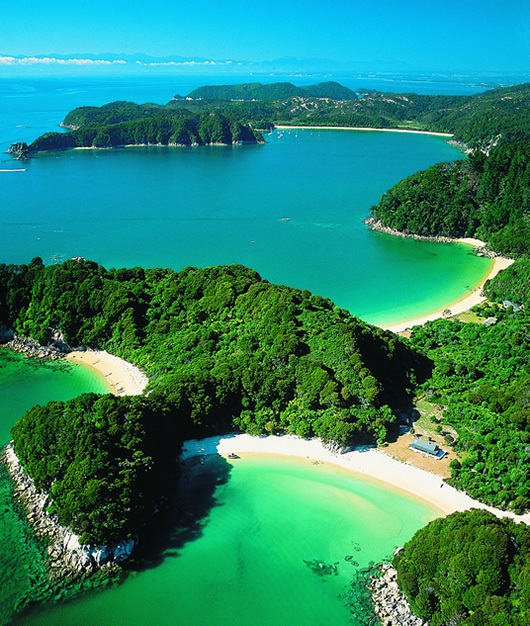 At one lookout, at least 100m up, we look around the bay and the water is so clear we spot many sharks in the water. 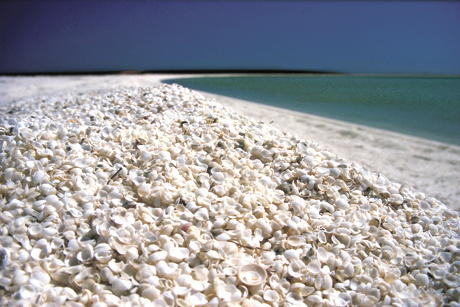 We later went to Shell beach which as the name describes is made up totally of tiny shells. The beach is idyllic looking, literally blinding white while the sea turquoise and very clear and while lying in the water someone in our group spotted a reef shark not too far away! Hardly the size of Jaws or worth worrying about but still I don’t like the thought of sharing the water with sharks. 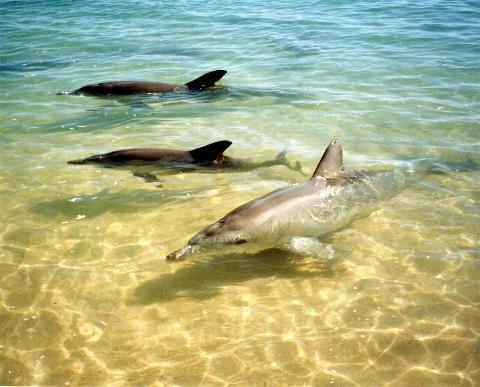 Monkey Mia – no monkeys but plenty of dolphins that swim up to the shore and come within a few inches of you! Truly magical! Altogether 10 dolphins were there at the same time. Monkey Mia – no monkey’s to be seen! Coral bay – so nice here I stop off for a couple of days. 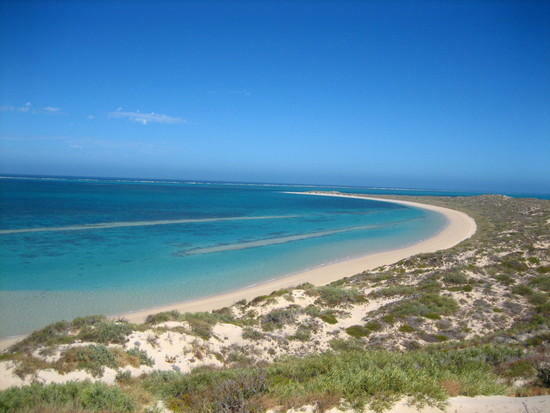 Ningaloo reef is only 10ft from the shore and in my books is a much better reef than the Great Barrier. I contemplated going on a trip where you go out to sea and snorkel with whale sharks – they are huge some reaching 8 meters, however it was over 150 quid and I ended up getting a quad bike and sped around the dunes and went snorkeling from deserted beaches further north seeing some amazing underwater life. Massive stingrays, turtles and a large variety of tropical fish. 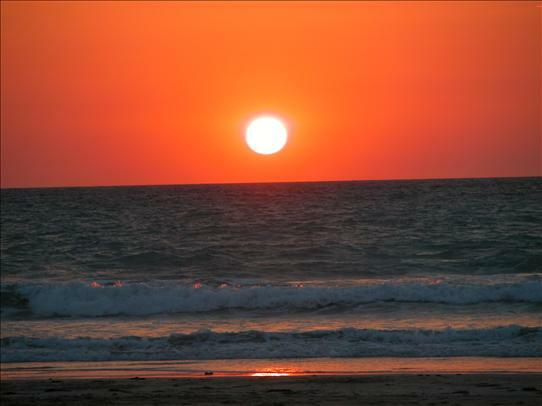 Sunsets were spent on the beach having a few drinks with my newly found friends. 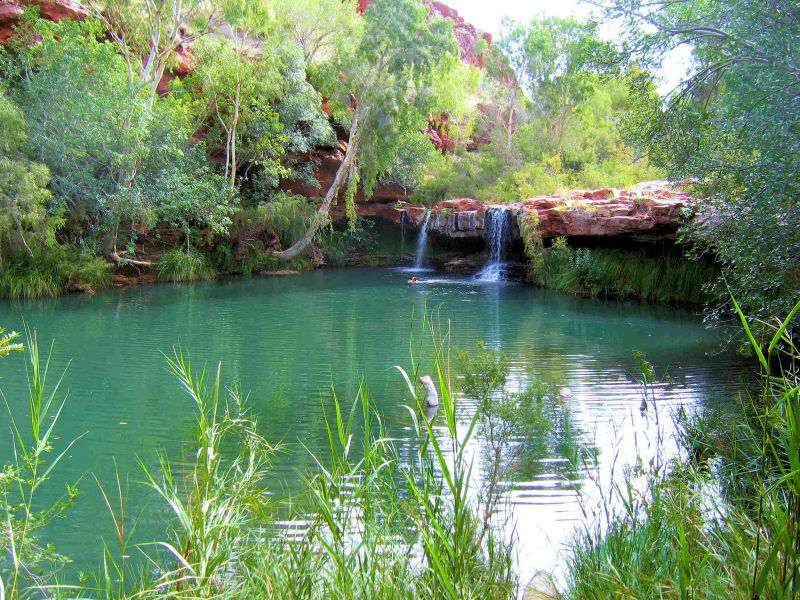 Karijini National Park – yet more stunning gorges, but they differed to Kalbarri. Again climbing up and down, under and over rocks to get to beautiful pools with waterfalls where you can dive in for a refreshing swim – only mind the pythons! I spotted quite a big one in one gorge and my fear of snakes after seeing one got in the way of me fully relaxing in the pool! Especially after Carl the driver said last time he was there a massive one was swimming around! Thanks Carl. 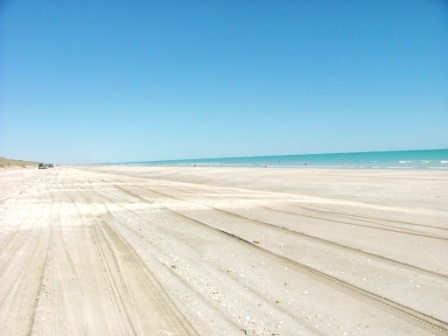 80 mile beach – self explanatory, white sands, pale blue sea, very wild, very long! Love it! 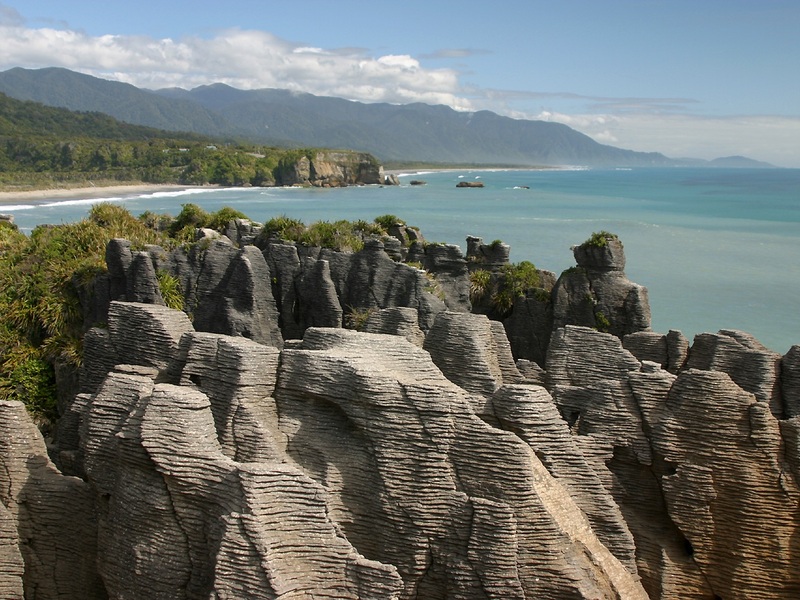 80 Mile Beach – Yes please! Broome – did I mention the temperature has been steadily increasing on the journey up the coast starting around 28 degrees and now reaching over 40 degrees and quite humid! A big night on the beers was had the night before I left and I nearly died struggling in that heat with a banging hangover and no air conditioning! You jump into the pool or sea expecting relief only to find the water is bloody hot! The cold water in the shower is hot! You just can’t win! Unfortunately, cold beer is one of the few things that’s cold and refreshing so it all ended in tears. Broome is surprisingly small and it was quite bizarre when I left the hostel for the airport – a journey on foot of about 5 mins. It’s literally right in town. An uneventful flight later I’m back in Perth for some relief from the heat and am welcomed back in the land of luxury at my friends house. The next day was spent doing as little as possible until the evening when we set off for our trip down South. 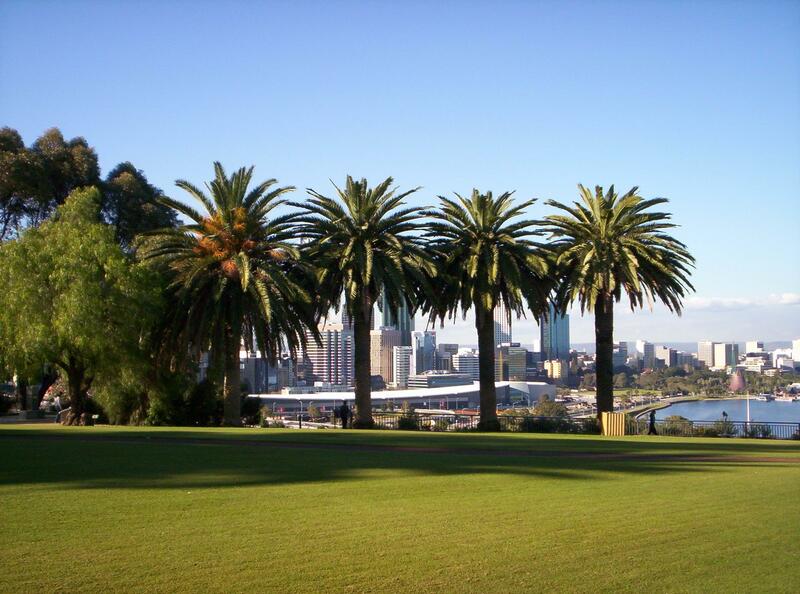 Before exiting Perth we go to Kings Park to eat our takeaway Thai’s. 4km sq of parkland high up on the western edge of the city overlooking the lit up city and Swan river which is more the size of a very large estury, a very nice spot with great views. 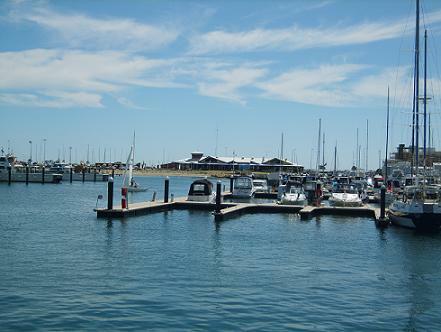 We then head for my friends beach house about 90 km out of Perth near to a holiday spot called Mandurrah. I’m up at the crack of dawn on the beach to see the sun rise. Despite now being on the West coast I still enjoy the light reflecting off the clouds and take in the sound of the ocean crashing into shore. Not a bad way to wake up and gather ones thoughts. About 150 photos later I go back to the house for breakfast which started healthy but soon deteriorated into eating Lamingtons with cream and Mum’s home made cake which became our staple diet – my friends insisted we were on holiday thus had to eat junk and lots of! After breakfast we take the boat down to the water for our trip around the estury and in and around the housing estate where magnificent large houses have the water as their back yard complete with nice boats and moorings! This seriously is a nice lifestyle to have. Not only that but dolphins I’m told quite often are sighted swimming around and I was not disappointed when we spotted two which we followed around for a bit before stopping off at a park where we had a good old Australian Barbie and some of my new fave beer to wash it down. Pure Blonde is the latest attempt from Carlton & United Beverages to crack the so-called “health-conscious” beer drinkers’ market. (Notice I didn’t say “female beer drinkers”, although that’s presumably the main target for this “low-carb” brew.) With 20 percent less carbohydrates than standard, full-strength beer, Pure Blonde promises to keep you slimmer (apparently) without wimping out completely and drinking light beer. Not only that but it tastes great and still maintains a good % alcohol content. Well I’m sold by the idea! 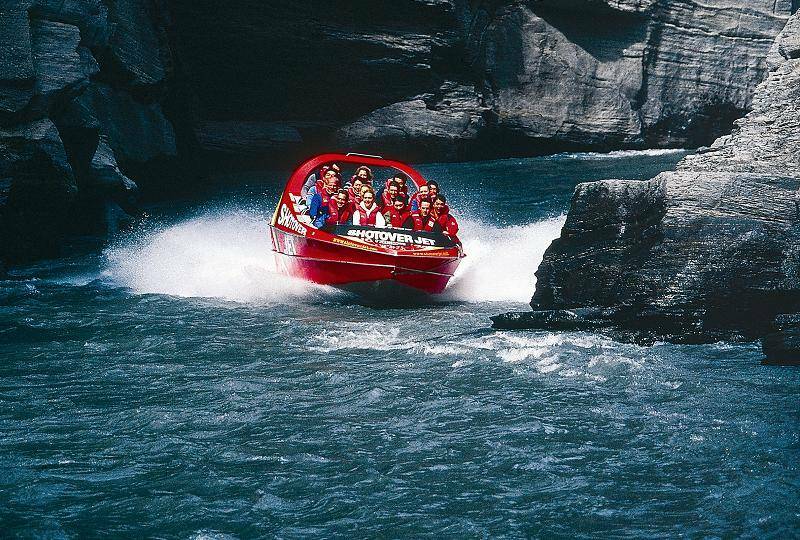 Back on the boat and I’m put in charge and drive it all the way home – so much fun – I want one! 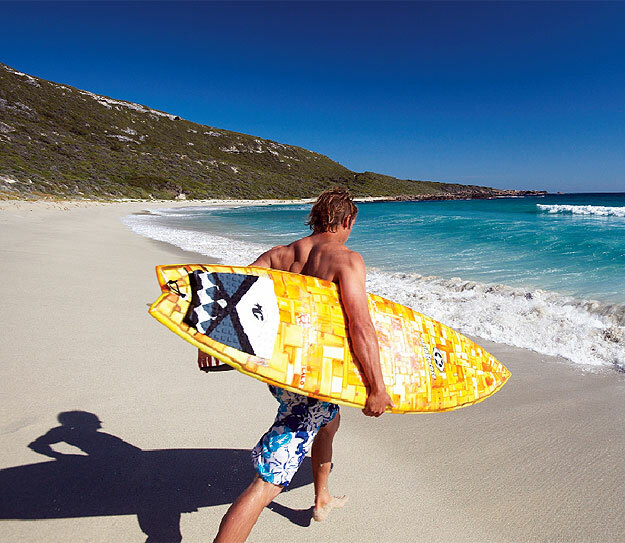 We later leave the beach house to head further south to another beach house at Eagle Bay in the Margaret River region, famed for it’s wines but there’s also some pretty awesome surf beaches and coast line. On arrival we make it down to the beach for the sunset with fine Margaret river wine (no more cask wine for me), cheese and biscuits – how refined I’ve become! The next day we attack a fair few of the abundance of wineries for free wine tastings, we are obviously selective and visit the best. Lunchtime is spent at the brewery to break up the wine drinking by sampling beer! The countryside down south is far removed in many ways from up north. 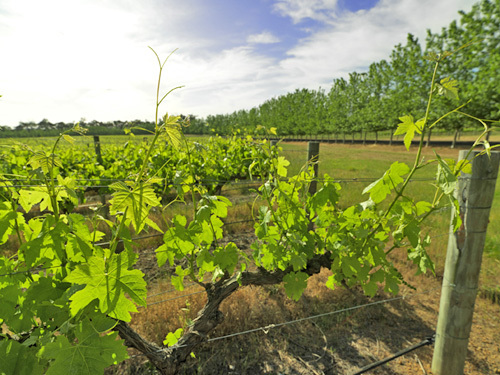 The climate is much cooler and if you take away the orange soil, kangaroos hopping around, beautiful coastlines, vinyards and karri trees, you would not be mocked for comparing it to the countryside to England. On our way back to Perth, we stop for a stroll along the Busselton Jetty. Claimed to be the longest jetty in the southern hemisphere and at 2km long I am not about to argue with that. Such a picturesque place and there’s even an aquarium at the end of the slender jetty. 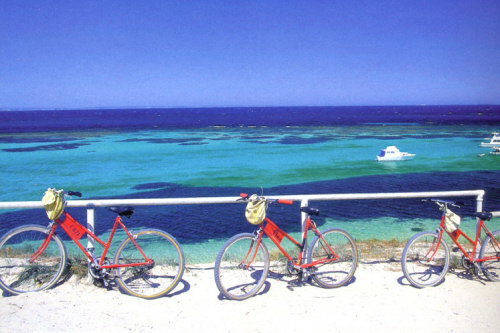 The day after returning to Perth we take a trip out to Rottnest Island, roughly a half hour fast ferry ride. Only workers there are allowed to live on the island and visitors are forbidden from using cars thus cycling is the mode of transport. What a great day cycling around the coastline and inland to the salt pools and old colonial buildings and barracks as this island was once home to the army. Snorkelling here was great and at one site I felt I was in the middle of a giant fishbowl with fish all around. I’m not about to say how stunning the beaches were and how clear and a gorgeous colour the sea was for fear of repetition but I never cease to appreciate such things. The day passed far too quickly and I could have easily stayed in one of the holiday homes for a long time however the sights of Perth were calling! Next day I’m taken to a couple of pubs in Cottlesoe beach and onto Fremantle which is a great place to eat fish and seafood! Unreal! I was also taken to Little Creatures, a brewery kind of pub thing by the water, I loved it there so much I even bought the t-shirt! Yesterday, we went into the city and surrounds and did Kings Park by day which is a completely different experience to night. 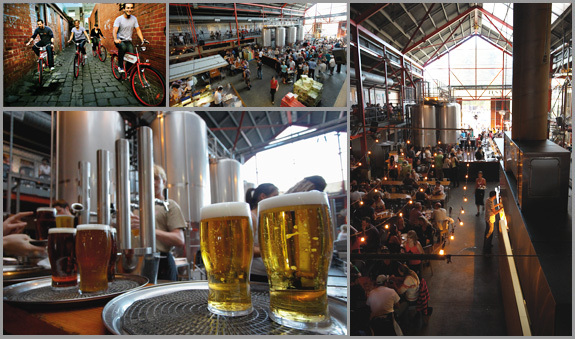 Little Creatures Brewery, Freemantle – Tres cool! Today I will probably head into the city again for a touch of window shopping as there’s no way I could possibly fit anymore stuff into my bags and then to the beach for my last chance of rays! I keep telling the girls they have to start taking me to horrible places so I won’t mind going home so much but they told me the only horrible place they could think of was the airport and they would take me there Tomorrow! Thus, alas the day is looming closer and tomorrow will be my last supper (in Australia for now!) before I board that big bird in the sky for the mammoth journey home. That’s if I am allowed on the plane as the girls have planned a big day out for me, starting off at the Vic pub for drinks and lunch, then to an Aussie rules football game, one of the girls knows a few of the Carlton players so we’re invited to some party thing, then they want to show me a few more pubs before rocking up at the airport at 11pm! Well, I’ve got to make the most of my last moments. Besides, I should have drunk myself sober by then hopefully! Then back to reality for me! It’s a cruel world at times. Yep, I’m still alive and well in Zimbabwe and for those wondering I’ve seen no sign of political unrest. I think people here are more concerned with the rapidly deteriorating economy that has resulted in food and fuel shortages and insane inflation. Queues for bread, milk, etc are a common sight and then rationed when you finally reach the end of it! A four hour queue for petrol (if you can find it) is the norm and things are getting quite desperate for many. This is the story for many and it makes me feel uncomfortable when I have not gone hungry but landed into the lap of luxury. I have been staying with a really lovely Zimbabwean family who have adopted me and can’t do enough for me. I have been living the life of a queen with a plate sized steak for breakfast! The neighbourhood they live in resembles Beverly Hills, very nice indeed and their large house is complete with maid and gardener. I made the mistake of thinking the dogs were pets and went to stroke one but soon realised after he took a chunk out of my leg that they are in fact guard dogs! I even have my own personal chauffeur called William at my disposal to take me where my heart desires – which was straight to the poorer area’s of town to see how the majority live. After Fedelis, the head of the family who works for Barclays Bank sorted me out with some black market money (an exchange rate of $1000 Zim dollars to $1 US, compared to a bank rate of $50 Zim to $1 US), I hit the streets of Harare with his daughter Vari to hunt out some bargains. It wasn’t long before I got back into the swing of bartering and was procuring some heafty discounts, paying 40% of the asking price. The locals were asking Vari where I had learnt to bargain so well and were impressed. I then got a bit of a guilt complex, realising that these people depend on tourism which is sparse at the moment and needed the money to buy food so got far too carried away trying to give everyone a bit of business at fairer prices and ended up adding an extra 17KG to my already heavy load! I could open a shop with the amount of stuff I have bought and this is just the start of my trip! A day of shopping and touring the local attractions such as the Balancing Rocks was followed by a day out of town at a game park and what a great day it was. I was the only tourist there which, while fantastic for me, was quite bad for the tourism trade. Due to the troubles in Zimbabwe tourists have been warned to stay away – obviously that doesn’t stop me though. We managed to get up close to many wild animals that you could only see in Zoo’s in the UK. Such a wide assortment. My finger was a bit too trigger happy and I was shooting film like it was going out of fashion. Opening my window to get a better shot was probably not the brightest of idea’s but actually getting out of the truck was pure stupid but I got some great photos! While at the park I met Tommy the 300 year old massive tortoise with a sign on his back that read: ‘Please do not sit on me or kick me’ – Poor sod! He took quite a shine to me and I’ve never seen one as huge of him move quite so fast! I also got to play with lion cubs who’s claws are decidedly sharper than the average domestic feline. Funny how something that looks so cute can hurt someone so much! While I was in Harare I was shown around the main sites of the town including Bob’s residence (Mugabe) and Zanu HQ. I won’t tell you that I took a picture with my SLR camera and big zoom lens, unaware I had a fake press pass in my filofax which was in my bag (I had this made for about 50p when in Thailand as thought I could blag my way into gigs for free! While fake it looked pretty genuine and in view of the fact British journo’s are currently banned from the country, it’s probably not the smartest of moves!). I kept abreast of the news and current affairs which not suprisingly were heavily concentrated around politics. It was very interesting to say the least to see how the news here paints a completely different picture to the situation painted in the press back home. Apparantly, Tony Blair is heading the opposition MDC party and is attempting to revert Zimbabwe back to British rule! Don’t you just love propaganda. My view is that Blair is probably not interested in helping the African nations as England has already raped these countries of their natural resources and is more interested in the oil producing nations as that’s where the money is at. That is just my sceptical opinion and I am not an expert in these matters so I should probably keep my unfounded views to myself. During my stay with the Mubaiwa family, I was introduced to traditional Zimbabwean fayre of Sudza, a chicken dish and a dish resembling spinich that’s mixed with peanut butter. This is all eaten with the hands. I have also learnt of a new way to drink red wine by adding coke. At first I was horrified at the idea of watering down good wine but not shy of trying out new things I took a massive swig and it seemed to go down fine. Fedelis tried to convince me that the drink has portuguese origins but I was dubious and thought that he’d been pre-warned about me and vino thus it was a ploy to water it down! This morning I bid my farewells to my new found family and their lovely home and boarded a plane for Vic Falls to slum it. Harare was hot but Vic Falls on arrival was swealtering, well at least for the first hour before the heavens decided to open, and open they did. Rain fell heavily from the sky, and fell and fell and is still falling – It’s like being in England! Now, I know it’s monsoon season and rain is much needed but it’s interfering with my plans to get a tan! I am now sat awaiting the arrival of the truck which will be my home for the next 3 weeks and on board should be my kiwi friend who is unaware I am here to meet her – poor girl! So I guess the night ahead will consist of sampling lots of the local beers and catching up. In fact the bus has just got in which is great timing so it’s time for you to wake up now ‘cos I’m outta here. We hit Nepal nearly 3 weeks ago and words cannot describe how beautiful it is. The scenery is amazing, big lush green paddy fields, big green hills with massive snow capped mountains in the background that look surprisingly near. I really like the Nepalese people too. It is definitely my most favourite place so far…. Our first stop was in a village just outside Chitwan National Park. Chitwan is in the Terair region of Nepal. It’s sub-tropical forest with rice paddies and numerous rivers. Scattered around are mud huts and bright coloured sari’s. So green and sparsely populated. After India it is just what we needed. While here we did the customary elephant safari to see the rhino’s. 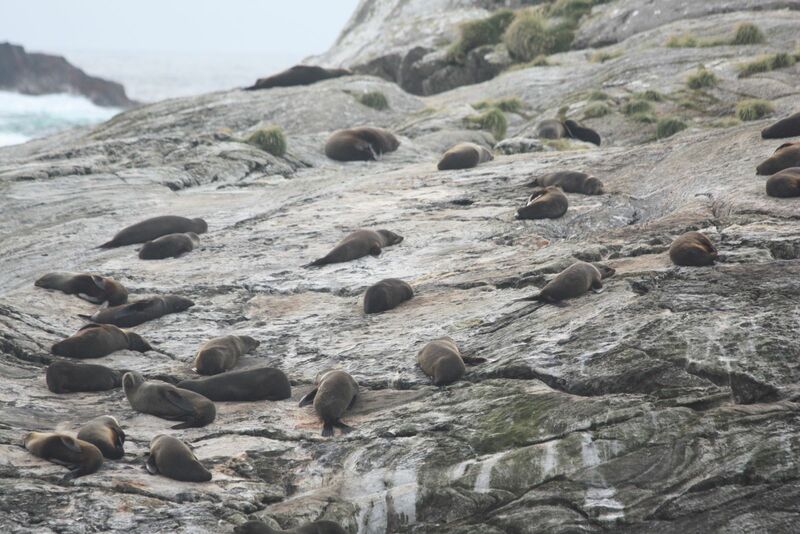 Was a bit disappointed not to have seen the tigers and freshwater dolphins – other residents of the park. I also went down the river in a canoe in search of crocodiles, stopping off at an elephant breeding center to play with the cute baby elephant. From Chitwan we headed to Pokara where we stayed by a massive lake. Pokara was great and very hard to leave. Well apart from the rain. When I say rain I am not talking of your average occasional shower as experienced in the UK. This is full blown monsoon rain – once it starts it doesn’t stop. The skies open with a vengeance and after 20 mins the road transforms into a river complete with rapids! Quite amusing at first but can become a bit tedious. However, the monsoon season is coming to an end so there has been less rain everyday. While in Pokara I went on a 4 day white water rafting expedition down the Kali Gandaki River (4hrs west of Pokara) and had the most fantastic time. Far superior to any white knuckle ride I’ve ever been on and I can’t wait to come back one day and do a longer trip. After a days rafting we’d set up camp on a beach and consume lots of rum punch. The others on the trip were a good laugh as well as the Nepalese guides. I am now in Kathmandu after quite a long bus journey and have just been round Dunbar Square. Not long left now in Nepal before we leave for Bangkok tomorrow. I’m falling asleep at the keyboard so guess it’s time to finish and go and take a nap – such a hard life!